To create the perfect massage, dozens of pulse, swirl, deep tissue and air massage jets have been precisely positioned to target muscles in your back, neck, shoulder, legs and feet (never on the spine), creating an awesome hydro-massage experience. Some models also have a powerful ‘volcano’ jet – perfect for targeting your calves, thighs, lower back and stomach. Each seat features a different jet layout to offer multiple massage effects as you move around your spa. Choose your seat. If you want, you can swap the different jet types around the spa to create the right massage effect. 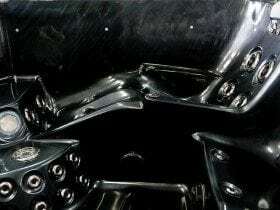 Then adjust the strength of individual jets and use the massage controller to make the whole seat softer or stronger. Once you’ve created the perfect massage to suit your mood, just relax and enjoy. Most of our spas have one or two “full body” massage lounges, giving you an unbeatable neck to foot massage. What about a neck and shoulder massage? The majority of models feature our neck and shoulder therapy collar for an awesome massage experience that relieves stress in your upper body, neck and shoulders. Most other brands of jets have small and/or straight water outlets. The jet stream can dig into your back which is uncomfortable and annoying. 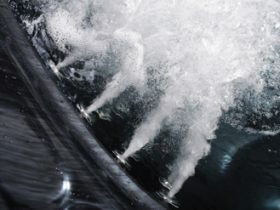 Our broad stream aqua-ssage jets distribute the water flow more evenly providing the optimum hydro-massage experience. Our advanced water management system makes it easy to keep your spa water clean and crystal clear. Splashes can also offer you a choice of natural, chlorine free spa sanitation systems that replace harsh chemicals and corrosive salts. These products are fantastic to bathe in and are perfect for people who hate smelly spa water or suffer from skin or eye irritations. Entertainer spas are designed to create the ultimate spa experience by ensuring your total comfort and relaxation. When you sit in a spa full of water you’ll soon realise that “lay back” recliners and curved-backed seats make you float and that most spa seats are not comfortable. The shaping of our recliners and seats help keep you in place – making sure the jets hit the right spots and allowing you to relax and enjoy your spa. 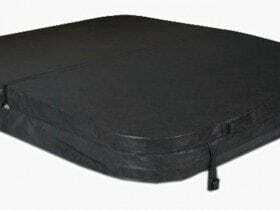 Our seating designs are barrier free, allowing you to move easily between the seats. Check the size of the footwell in other spas when doing your shopping. In many cases, you’ll see that there’s not enough room for everyones feet. By reducing the wasted space around the outside edge of the spa and making our footwells bigger there’s more room for your body, legs and feet in an Oasis Spa. To achieve total relaxation you need peace and quiet. 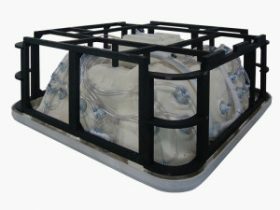 Oasis Spas build one of the worlds quietest spas, using quality pumps (with anti-vibration mounts) and our 8 stage insulation system to reduce and lock in noise. Set the perfect mood for total relaxation with soothing aromatherapy fragrances and mood lighting. Create the perfect ambience with underwater, water-level lighting and tranquil backlit waterfalls -standard on most models. Some of our XL spas also feature backlit drink holders, ice buckets and roman water-features. Ask about our optional backlit massage, air and waterfall controls for extra impact and appeal. Our liquid based aromatherapy system works wonders! Surround yourself with soothing fragrances with our adjustable liquid aromatherapy system specially designed to work in the spa environment. At Splashes we have the replacement aromatherapy cylinders available when you need them. Add one of our sound systems (with optional in-cabinet sub woofer) and you’ll never want to leave your spa. 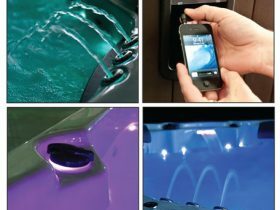 Your Oasis Spa control system offers you unlimited ways to tailor your spa to save money and meet your needs. After initial setup, it remembers your settings and automatically manages your spa so it’s always at the right temperature, clean and ready to enjoy 24 hours a day. This system also boasts a handy “lockout” mode and a “weekend” mode (that maintains your spa at minimal cost if you’re not using it during the week). This controller is super intelligent, leaving you to simply turn on the jets and lights, relax and enjoy! Timber cabinets require regular staining and oiling. Who’s got the time and patience for that! Our cabinet cladding is made from a UV treated synthetic material specifically designed for harsh Australian conditions. 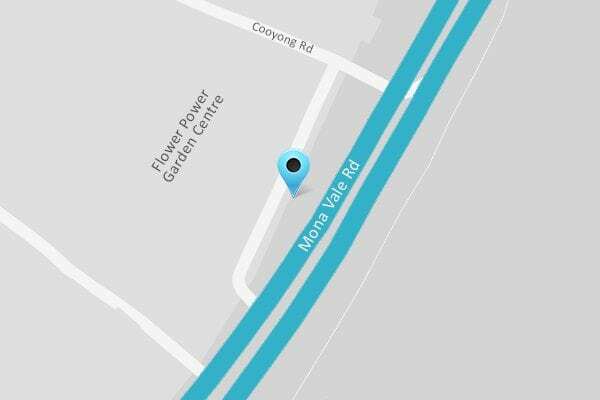 A quick “hose down” from time to time and you’re done. 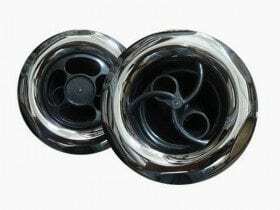 Spinning jets are awesome, but to keep them spinning, most brands of jets have to be removed and cleaned regularly to clear the bearings of grit, chemical residue and body oils. The trouble is that removing most jets can become impossible as they often become “stuck” into place. Our premium Aqua-ssage jets are self cleaning and they always spin freely on a floating stainless steel spindle. If you ever want to remove them, they simply screw out. They always work and no maintenance is ever required. 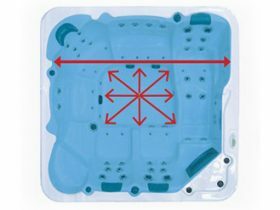 Oasis Spas incorporate state-of-the-art water management technology that minimises the use of chemicals, keeping your water crystal clear with as little effort as possible. 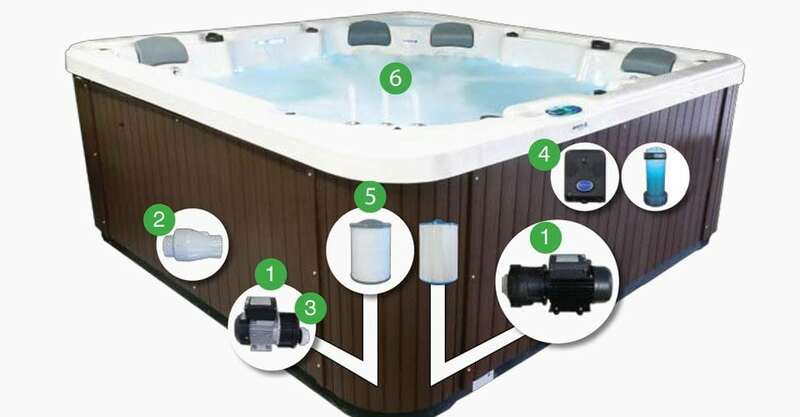 To maximize water quality and filtration, Oasis Spas run two pumps through the filter system, giving a major boost to filtration while you’re using your spa. 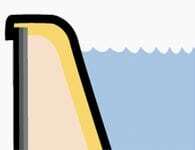 In most spas, a large proportion of the water bypasses the filter system. 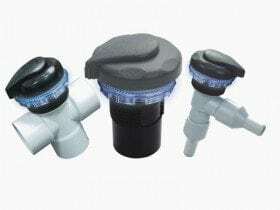 Oasis spas use a patented valve in the plumbing system to minimise the amount of water bypassing the filters, giving you cleaner, clearer water. This clever valve also protects your pump and stops entrapment by opening if the filters or suctions are blocked. 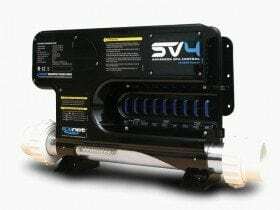 Unlike “24 hour” filtration pumps (which lack significant flow), our high flow filtration pumps have a stronger filtration and surface skimming action for superior water quality. And our dual pump filtration system means that your massage pump can provide additional filtration and surface skimming when required. 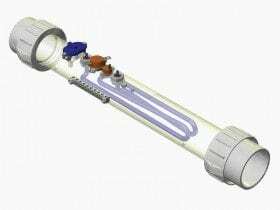 An ozone system, when used correctly, is a powerful, maintenance free and proven method of water treatment that is used in almost every spa worldwide. Our CD ozone system helps keep maintenance and chemical use to a minimum. For less maintenance and better water clarity, you can use a disposable 1 micron “silver ion” micro filter for your filtration pump. These cartridges are up to 50 times more effective at removing fine particles. They don’t need to be cleaned and soaked (just surface sprayed) and with anti-bacterial properties, these filter cartridges reduce chemical use. They do, however, need to be replaced every month or so. Oasis Spas retailers offer a choice of natural spa sanitation systems that are chlorine and salt free and have no odours. They are safe for your family, pH neutral, easier to use and feel fantastic to soak in. Hot air rises naturally. If your spa has large gaps between the cabinet and the spa shell, the heat inside the cabinet escapes and cold air enters your spa, causing the heater to turn on more often to maintain heat. Pests and insects can also enter and damage your spa. We tailor make every cabinet so there are minimal gaps, trapping the heat in. 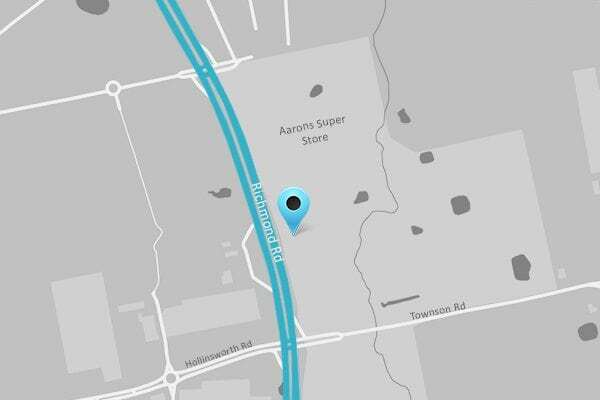 Without this feature you are simply throwing money away. 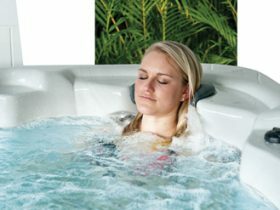 In most cases, our unique insulation system makes electricity the most convenient and affordable way to heat your spa. 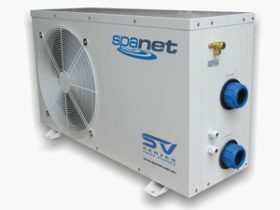 For very large spas and swim spas, in cold climates and in the future, heat pumps will be the most economical solution. 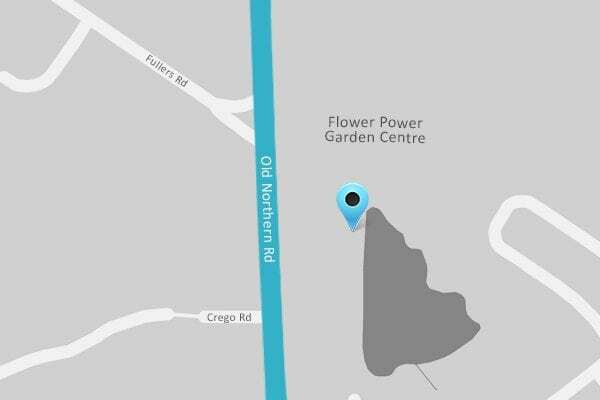 Every Oasis Spa has the control system, pump and connections already in place, so you can connect a gas heater or heat pump at any time and start heating your spa at a fraction of the cost. Our state-of-the-art spa controllers with “intelligent thermal tuning” learn how to minimize heating and pump running times, reducing running costs by up to 20%. Handy “eco”, “weekend” and “away” modes provide other ways to suit your individual needs and save you money. Only a handful of brands worldwide have all 5 power saving features. While one brand uses a slightly more efficient pump for filtration, this pump offers a less powerful massage. 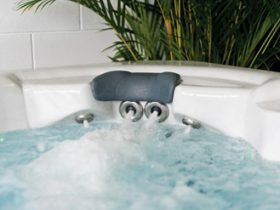 As our insulation system is superior, Oasis Spas are cheaper to run without compromising your massage experience. Our integrated heat pump technology allows you to control a heat pump from your spa touchpad. Heat pumps save up to 75% on heating costs by transfering heat from the air into your spa water, turning every kilowatt of power into 5 kilowatts of heat. As a bonus, they even cool the water in summer, offering total temperature control with minimal cost. 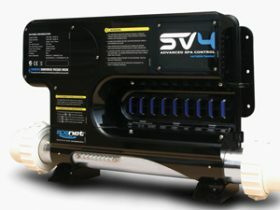 Our “energy smart” filtration pumps use up to 60% less power than 2 speed and other filtration pumps and only have to run 4 hours a day (not 24 hours a day like many other brands). 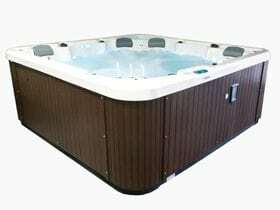 The Platinum Series comes out of the world class Oasis factory so you know the spa will be built to last and easy to maintain. 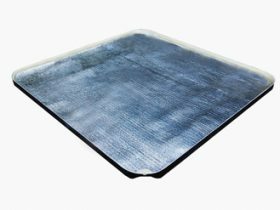 Our 6 layer laminated “tough bond” shells are one of the thickest shells available (8-10mm thick) and our oven curing process ensures your shell is as strong as possible. If you shop around, be sure to check the thickness of the spa shell. Our “tough built” treated timber frames have triple reinforced corners, cross-bracing and supports under every seat. The entire frame is then protected by chemical treatment, paint and a wrap-around base. 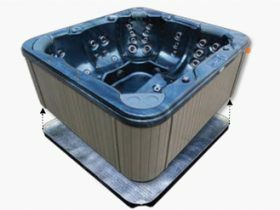 Our Whitehaven spa and all Swim Spas have a galvanised steel frame for extra strength. For maximum strength and long shell life, we’ve designed a 3 stage “no flex” construction to lock the shell, frame and fibreglass base together and form one super strong cross-braced structure. Then we added seat supports for even more strength. Nothing can flex so there’s never any stress on the shell. Most brands of jets are made from a type of soft plastic that breaks down in time due to damage from spa chemicals. This causes the clips that hold these cheaper jets in place to become brittle and break. And the bearings that make them spin often fall apart after a few years. Our “aqua-ssage” jets are made from hard PVC (with stainless steel trims) which won’t deteriorate. They have a screw-in mechanism (no clips to break) and they spin on a floating stainless steel spindle (so there are no bearings to fall out). Oasis spa heaters use 316 stainless steel housings and teflon coated Incalloy elements for the ultimate protection against calcium build-up and corrosion by water and chemicals, ensuring long life and maximum performance. 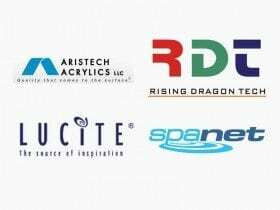 RD technologies provide high quality components that are used in premium spas worldwide. 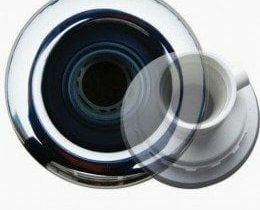 Every component is designed for maximum performance, functionality and durability to ensure they stand the test of time. 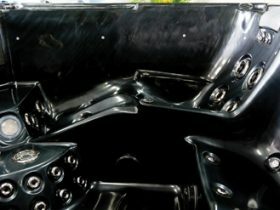 Only the best components and materials are used to build an Oasis Spa – including pumps and control systems from Spa Net Australia, German Silicones and American acrylic. 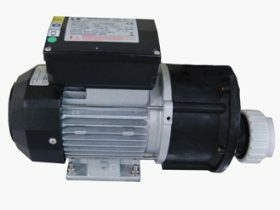 Our massage pumps are built to last and our filtration pumps use a smaller, specially designed impellor to reduce stress on the motor,cutting power consumption and significantly increasing pump life. 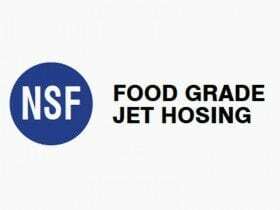 Most spas do not use “food grade” hose for their jet plumbing. This is dangerous as the chemicals in this cheaper type of hose will seep into the water, which you then absorb through your skin. Our clear “food grade” hose is specifically designed for use in chemically treated hot water and won’t kink or deteriorate. Most importantly you won’t be soaking in potentially dangerous chemicals.